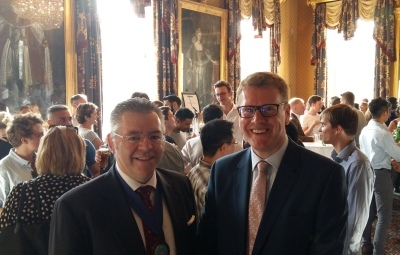 David Stringer-Lamarre, within his role as Chairman of the Institute of Directors (IoD) City of London, was pleased to attend this launch event. Stephen Martin, Director-General of the IoD made the welcoming addressed and formally launched the Pride in Business Network. Liz Bingham OBE, Managing Partner at EY spoke about the importance of continuing to emphasise the need for diversity and inclusion. Iain Anderson, the Executive Chair and co-founder of communications firm Cicero Group spoke about the power of networks and how pleased he was to see the Rainbow Flag flying from the IoD’s mast in Pall Mall. The Pride in Business network will bring together IoD members and LGBTQ+ and LGBTQ+ friendly individuals from the wider business community to chat, share stories, and perhaps even do business together. The IoD’s Royal Charter, received back in 1906, obliges us to deliver support to members – and this is part of that effort.